"Blessed Be The Ties"/"Lost In Her World"
"Of The Little White Clouds"/"Whatever Life Demands"/"Children's Fantasy"
"Quite Suddenly"/"Beneath The Blood-Stained Lintel"
"I Have Days Like You"/"Chase The Bad Away"
"Wedding In The Country Manor"/"Procession Of The Hoppers"
Let me start with some questions to "fill in some holes" in your biography. You were born in 1951, the ninth of ten children. Your parents' names were Jim and Marguerite? Yes. In fact, Alicia's middle name is Marguerite. Was it in Hubbard, Ohio, that you were born? I was born on the north side of Youngstown---I think Northside Hospital---and lived out in Hubbard, in the rural area. That was where, at the age of four, you had the accident with the water pump [which severed Phil's right middle finger]? When did you start playing guitar? Some articles about you mention you started playing when you were around 10 years old. Right. I used to copy playing the guitar; I used to pretend to play guitar, for many years. And you know what? I still pretend now and then! [laughter] You do a great job! It's pretty convincing! I wanted to ask you specifically about that piece! That is just a brilliant piece of music. I really love that piece of music. I'll tell you how that happened. Michael Card was doing a radio special about the imagination, and he said, "Could you come to the studio..."---he has a studio called Mole End, and he has Calvin Miller on tape, just reading the story---and if I could, could I put some music to it, while I'm listening to it. Actually, they wanted me to hear the story, and then I was going to make music, and then they were going to put it together. What I ended up doing was saying, "Why don't you let it roll on tape, and give me a stereo track, and I'll just play along with what I'm hearing." And so we did it once through, and I said, "Let me have just one more pass from beginning to end nonstop." And it was the second take. So that was just improvised?! That was not worked out?! No; nothing was worked out. In fact, the first time I went through it, it was different from the second time. I really enjoyed that! What you hear---some of the phrases on the guitar---were just lines as I was responding to what I was listening to. So it's good to be a musician who listens to what's going on around you, even while you're playing. That is remarkable to me. I've heard a lot of stories read by actors, with musical accompaniment, and your accompaniment is one of the most appropriate. The way you match the events in the story---like the way you hit those high notes and those harmonics when the puppet's strings are clipped---it's almost unbelievable that you did that "on the fly." That's incredible. Well, you know what I'd love to do, someday? The Chieftans, Bobby McFerrin, Mark Isham... a lot of artists on Windham Hill have done that very thing, where their music is accompanying the telling of a story. I would think it would be a wonderful experience to do a project like that. They did a really great thing when they did it for Windham Hill. They would have the recited story with the music accompaniment. Then, after the story was over, they would have just the tracks, which is just brilliant. Sometimes I like to listen to just the music because you know the music was inspired by a story. Yes, those were the ones that I had heard, too; Michael Hedges has one. Oh yeah! Yeah! And that one I've not heard. So let's see... you were playing guitar around age ten. Sometime after that, did your family move to California? I actually asked for a set of drums for my tenth birthday, 'cuz I was into Sandy Nelson. I really love drummers; I enjoy watching Gene Krupa in the movies, Cozy Cole. My dad came home on my tenth birthday and gave me a Sears Silvertone, which was about a $19 guitar. [A photo of] an exact replica of that guitar is on the Way Back Home album---you can see a guitar with a white pickguard. That was the kind of guitar, and when I first started playing, I didn't know chords, I didn't know anything. I'd put the guitar in my lap and I'd play with my thumb and with my other thumb. So that's how it started. The first tune I recall playing, I think, was "Third Man Theme;" the second tune I think was "Peter Gunn"---the theme from "Peter Gunn." Real simple melodies. And then my brother Dave, who was a guitar player, spent some time with me when I was eleven. We moved to California in 1962; it was in the winter, because I remember driving across. Where in California did you move to? Wow, you moved around a lot! You wouldn't believe how much I've moved around! I don't know why. I think part of the reason was my dad's work. He was a structural ironworker. He also built bridges. I wrote a song for him recently called "Paka" that I hope to record. It's an alternate-tuning guitar song; the tuning, from the sixth string down, is E B C# G B E.
That is peculiar. Was "Paka" your nickname for him? That was the name that most of his grandchildren called him. And consequently, some of his own children would refer to him as "Paka" because that's what the grandchildren called him. "Paka" I think comes from a Dutch name for "grandfather." I called him "dad;" and my kids call me "poppy," and have called me that ever since I can remember... and since they can remember! So... we lived out in California. Then---because my dad went where the work was available, and so we could stay together as a family---we moved back to Ohio in 1964, perhaps; I was in sixth grade. I went to Immaculate Heart of Mary school in Austintown. When we lived in Austintown, we lived on the corner of Racoon Road and Mahoning Avenue. I think it was a little shopping strip-mall, with a little laundramatte, grocery shore and shoe store, or something like that. There was literally a house set on top of this little plaza---the oddest thing you've ever seen---a green, shingled house protruding out of the top of a little strip-mall. We lived there! My very first performance in front of a crowd was before my fellow students in fifth grade. The name of the school was, if I'm not mistaken, Howard D. Cling school. Well, what I played was... My brother Dave, for Christmas in fifth grade, the year after I got my acoustic guitar, he bought me a 3/4 size electric guitar, with no name to it, no brand name. It was apparently custom made by somebody. It had one pickup on it, and it was a great guitar. That's where I really began to excel in my desire to learn. I played through a little Orpheus amp; he got me a little amp with like an eight inch speaker in it with just an "ON" knob and a "Volume" knob; I think it had two inputs. I played with a drummer---and I forget my friend's name---but the two of us played for our fifth grade class. Original stuff? Or Beatles tunes...? Actually, I think I did an original song called "Surfer Joe" that I wrote; that was the first song I ever wrote. The Safaris wrote a song called "Surfer Joe." But I wrote a song called "Surfer Joe" before I heard the Safaris' version! That doesn't mean I'm more original than they are [laughs]. I just came to California, and that's where people surfed! Then we did "Moondog," which was a Beach Boys tune, an instrumental. That's when John and I got talking. So I went back down to Ohio. I ended up moving in with a family called the Martins; if I'm not mistaken, Joe and Connie Martin. They were kind enough to take me in as kind of a son away from home. Mind you, I was away from my family since June, and here we are starting the school year. I enrolled back at Fitch High School, in the eleventh grade. Connie and Joe were a very friendly, Italian family. They had a son named Tommy, and another child, but I can't remember that child's name. John and I then put The Glass Harp together with a bass player named Steve Markulin. So our seven-piece group never did come together, but we ended up becoming a three-piece band. We ended up, later that fall and into the winter, doing a demo album, which some people have as a bootleg. It's got two horrible renditions of Beatles songs I completely butchered. One, especially, called "Eleanor Rigby." Was there a title for that album? Oh yeah! From Sunday's Child . Yeah, we changed the arrangement a little bit, and rewrote the lyrics; Lynn Nichols and I wrote the new lyrics to it. So that's another old song from the past that came back. So John and I worked with Steve for a while, I think for maybe six, seven, or eight months. Then John Carazino played bass with us for a short time. And then we had a manager in Youngstown, Geoff Jones. And then Dan Pecchio joined the band, and that's when we became The Glass Harp as the three of us. Geoff helped us get our start which I appreciate to this day. So you had actually been playing with John for almost a year in that band? Yes, before Dan joined. And Dan was older than John and me. We respected him; he seemed like the smart one, and he seemed to be the one who would always try to look out for the best for us. We soon ended up getting different management; Chip Killinger and Bill Able ended up managing the band. We ended up doing demos with Dan up in Cleveland. Eventually, Louis Merenstein came to hear the band play, and signed a production deal with us. We did our first Glass Harp album in September 1970, if I'm not mistaken. So you were 17 or 18 at this time? Is that how you got a high school degree? Yeah, that's how I got my diploma, through Lasalle, out of Chicago. Yes, I was. I remember going and picking out a Christmas tree with my mom. I remember that last Christmas with her very vividly. It really saddens me to realize that I was disappointing her, getting my head caught up in things. The Beatles were an identity; The Moody Blues were an identity. So when this accident occurred on Valentine's Day, I came home, and I was shocked and very saddened; but I thought mom was going to live. There was some indication, someone had mentioned, "We think she's going to come through it." And she passed away a week later. Was she concious at all during that week? Yeah, I went to visit her in the hospital, and the last thing she said to me and my sister Geri was, "I love you kids." Those were her last words to me. And I remember her eyes, and I remember her looking straight into my soul. And I believe her prayers are what brought me to Jesus. At the funeral, the first thing.... The morning of the funeral, I was staying at a friend's house. The clock radio came on to wake me up, and it was "Bridge Over Troubled Water." And so I couldn't keep a dry eye for the next two years every time I heard that song. It shows the power of music, because it was very sad, and yet comforting at the same time. My sister Ellen---my oldest sister, who used to be a movie star, a moderately successful actress for a short period of time---she brought me and my sister Geri to faith in Jesus. Was it the day of the funeral? Was that a Christian station? No, it was just a pop radio station. These men were very influential to me, as was Father Charles Crumbley, from St. Patrick's church. I was raised Catholic, but my committment to Christ occurred in an Assemblies of God church. But my mother's legacy of a life devoted to God and family, that's what really was the thing that made me hunger for God. There's a very touching interview with you just a month or two ago in CCM magazine, where you describe your mom as a "Roman Catholic woman full of the Spirit of God." I've never heard anything but respect from you about the Catholic church; but I've always wondered, as a Catholic myself, what was missing in your upbringing that Ellen was able to show to you that day. What was the final thing that helped you meet the Lord? I think it was not so much [something missing]... because the Gospel is preached in many Catholic churches, and the truth is known there. It was just the condition of my heart. As it says, "God would take away the stony heart, and give us a heart of flesh," a heart that's alive and human, and not hardened, not fossilized by the world [see Ezekiel 11:19; 36:26]. So I think it was me that changed, because it's the same Gospel. Over the years, I've been a part of many nondenomenational churches and denomenational churches, but I have even a higher regard and respect for my Catholic upbringing, because I believe it planted the seeds of faith in me. And I read books that give me a greater understanding of the Catholic faith today. I'm not a practicing Catholic, but I believe that I'm a true believer who responds to the truth that is there. Because it's ancient tradition; it goes way back. I think Martin Luther had some great ideas, and showed us that we're saved by grace through faith, but he was a Catholic when he posted all that up! He didn't all of a sudden become some Protestant; he was protesting the wrong that was there. I have great fellowship with my Catholic brethren today. I have some dear friends across the country that I've made. That's a whole other subject; but I think when the Lord looks at his Bride, he doesn't see the walls that we use to divide ourselves from each other. He sees one body, and that body is comprised of his children, those who he bought and paid for with his blood.... I love the liturgy; I think liturgy with the Spirit is one of the most powerful ways of communicating the life of God to us. That's certainly one of the attractions of Catholicism for me. God is in his body the church, Christ the head---all over the world. I'm talking to you from Ithaca [in upstate New York]. Sometime between the Glass Harp days and the birth of your kids you spent some time nearby in Freeville, at the Love Inn. How did someone who comes to Jesus in Ohio find out about this little community in upstate New York? How did that come about? Well, I left Glass Harp after doing three albums, and one live recording that was never released. Hopefully it soon will be! Perhaps they will soon. Dan Pecchio is looking into it. It might be released, just independently. That would be great; there's a lot of interest in it. Yeah; all he needs is a distributor. So, I left Glass Harp in August of 1972; and that was not an easy parting. Were you married to Bernadette yet? No, we married eleven months later, in July of 1973---which would probably be between eleven and twelve months later. I stayed on in Ohio after I left the band, and I played acoustic dates with a friend named Peter York. Right; he's now the head of Sparrow. Peter and I were and remain very close. He made me laugh like no one in the world ever made me laugh. It was just pure joy being around him; young, innocent, full of life, full of anticipation for the future, full of music. This was here in upstate New York? No, this was in Ohio. He lived in Warren, Ohio; I lived in Youngstown. I went up to Love Inn because I knew of the Scott Ross show. I heard the show on the radio, and I liked it; I liked the songs they played. So I went up for a visit, stayed for a couple of days, and then came back down and told Bernadette all about it. We got engaged in October, and sometime in the fall we went up for a visit, and we thought, "Well, maybe this is where we should move." You hadn't moved to Freeville, New York, at that point yet? No, no. We went out to California and played with Love Song. We stayed out there for a month, then came back to Ohio. While we were back in Ohio, we stayed with Bernadette's folks, and I'd go out on tour; I did two more tours, I believe. That was a great experience! I made some life-long friends, especially Tom and Shelly Coomes. Tom ended up being a big, big, serious help on The Wind and the Wheat . Yes, I was trying to remember what recent album I saw his name on; that was the one. Yup, with Gary Hedden, up in Cleveland. We'd do two songs a day; record 'em and mix 'em! That's how we did it. And Gary came to the Lord---he and his wife came to the Lord---during that period! During that recording? Or shortly after? Uh huh. I made some good friends, too. I met Turley Richards; ever heard of him? Yeah, there's someone you ought to investigate; what a voice! A great voice. In fact, he was produced by Louis Merenstein also, and did an album on Reprise Records. He had a great song called "I Heard The Voice Of Jesus." We keep in touch. So, in July 1974 Bernadette and I moved up to New York. We stayed there until August 1979. So the move was right after you recorded What A Day ? It was a year and a half after. In January 1973 I recorded What A Day , but didn't have a label for it until Scott Ross started a label called New Song. Then it was released in May or June of 1974. Did Sparrow eventually pick that up? No, Word did, through Buck Herring, who invited me to play on In The Volume Of The Book [by 2nd Chapter of Acts] in January 1975. Through meeting Buck and Annie [Herring] and Matthew [Ward] and Nellie Ward, I became good friends with them, and Bernadette became very close friends with them also. ... yeah, we recorded that in May 1976. An incredible album; there's incredible chemistry on that album between the players. Yeah, yeah, it was good. Then I continued to work with 2nd Chapter of Acts. I played on their Roar Of Love album, which was a Narnia album, in, if I'm not mistaken, December 1976. 1977 comes around, and I think somewhere along the way we did the In The Courts Of The King praise album out of Love Inn [the praise music of Ted Sandquist, featuring Phil and other Love Inn musicians]. At this point, Bernadette and I had lost children two times, during all this time; November 1975, August 1976, and April 1977. And one of those was a set of triplets? Yes, the first one, in November 1975. The story is in Bernadette's book, A Deeper Shade Of Grace . So Bernadette and I went on the road with 2nd Chapter of Acts and we did a tour. How The West Was One came out of that tour. Yeah, Lynn was in that band; and Phil Madeira. Did you know all these folks---the 2nd Chapter and Lynn and Phil---from Love Inn? How did you hook up with all these folks? I met Phil Madeira when I was on the road with Love Song in November 1973. I met Lynn Nichols when I was visiting Love Inn the first time in August 1972. And I met Matthew, Annie, and Nellie in January 1975. I met Paul Clark for the first time in November 1973 on tour with Love Song; that's where I met him, too. We all became good friends, and we still remain friends to this day. Do you still have friends in the Freeville or Dryden area? Yes, I consider Ted Sandquist a friend still. And although I don't talk to too many people up there, I remember with a grateful heart people like Peter Hopper and his wife Nina, and other friends who have moved away from there as well: Ray Crognell, who moved there while I was there; but he was originally from Youngstown, so we knew each other from the Youngstown days. Of course Madeira moved there, and Lynn moved there, and now they're all down here; Phil, and Lynn, and Ben Pearson. We were all friends up there together. Bill Clarke, who wrote the lyrics to "Ryan's Song," was up there. Oh! I didn't realize that wasn't your lyric. No, that was a poem he gave to me out of feeling grief for our situation. I was trying to write a song, and I couldn't. I wrote the music, I wrote the melody; but I had no words. He gave me the words, and it fit hand-in-glove, perfectly. I didn't change any of his words at all to make it fit my music, it just fit. So, Bill and Gloria Clarke, I appreciate them. And Chris and Linda Christensen---a lot of people who were very encouraging to my music. Chris Christensen---not Chris Christian!---he's a student, he's going to school for a degree in psychology. He is a C. S. Lewis and Tolkien enthusiast, and he got me interested in Lewis. In fact, he encouraged the music to "As The Ruin Falls." I said, "I got an idea of putting music to this," and he said, "You oughta do that!" And it encouraged me to do that. I wish to acknowlege and thank many people: friends, producers, record labels, managers, musicians, poets, authors, pastors, teachers, recording engineers, bookstores, record stores, distributors, artists, photographers, road managers, guitar techs, bus drivers, and especially my wife Bernadette, our children, my extended family, and most especially God in Heaven for his grace and provisions to me and mine these many years since the beginning of my days upon this earth. God bless you all with all that is good! 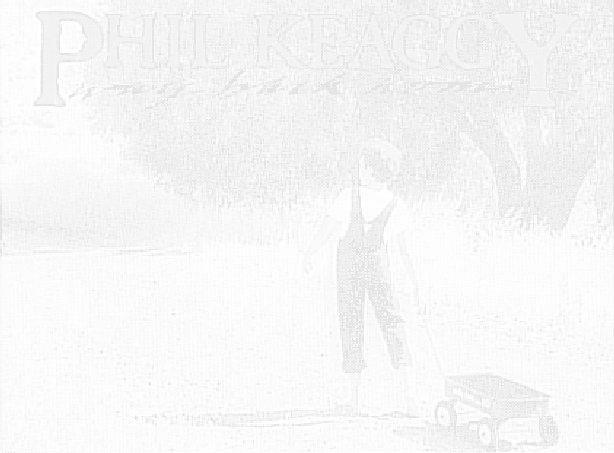 © Copyright 1996 by Phil Keaggy and Tom Loredo.